In stock -This product will ship today if ordered within the next 6 hours and 49 minutes. 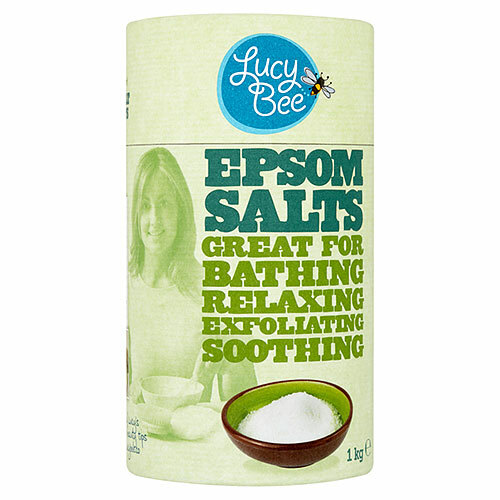 Lucy Bee Epsom Salts are a mix of magnesium, sulphates and minerals, which can be absorbed through osmosis by the skin. Epsom salts can help to detoxify and revive tired, sore muscles. Epsom salts have been used for centuries as an age-old beauty treatment and even home remedy. The salts are now produced under controlled conditions by replacing the carbon found in a naturally occurring rock called Dolomite and substituting it with Sulphur to create Magnesium Sulphate, a pure mineral compound. The salt can be added to a hot bath for a relaxing soak or as a homemade body scrub to exfoliate the skin. Below are reviews of Lucy Bee Epsom Salts - 1kg by bodykind customers. If you have tried this product we'd love to hear what you think so please leave a review. I love this product and have it in my nightly bath. It makes my skin feel silky smooth and will make sure I never run out.